"He wasn't in it to make money, he wanted to give. 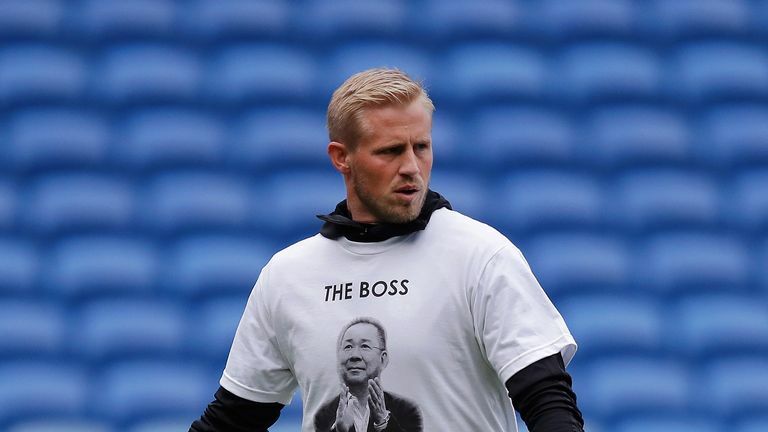 He had a passion for the club, for Leicester, all that he did for the city - the donations to the hospital and such"
Kasper Schmeichel reflects on the legacy left by late Leicester owner Vichai Srivaddhanaprabha on himself, the club and the city as a whole. Srivaddhanaprabha was among five people killed in a helicopter crash outside the King Power Stadium following the Premier League match against West Ham on October 27. Foxes goalkeeper Schmeichel told Sky Sports News of his close relationship with the Thai businessman, saying how his career turned around after he was made to feel at home at Leicester by Vichai and his family. "If you look back at my career, I've had to constantly prove myself and be compared to others. Constantly having to prove I am good enough," he said. "Then came a guy who said he believed in me from the first minute. He said he'd seen me play and just gave me the platform. "I've been here nearly eight years now and that says a lot about the stability here and the belief he had in me. Having gone from nine clubs to just being at one club, I was searching for someone who believed in me - he and his family did. "It's very easy to be caught up in this world of money, fame and fortune. He is a guy who has done all that and doesn't care about it. He only cares about helping people. "It just speaks to the man that he was. He didn't need to buy a football club. That's never a good business investment. "He wasn't in it to make money, he wanted to give. He had a passion for the club, for Leicester, all that he did for the city - the donations to the hospital and such. "It was ownership done properly. If you're a fan of any club, that's the type of owner you want, the type of owner you dream of having." There have been a number of tales of Vichai's kindness and generosity that have been made public since his death. Schmeichel told his own story of how Srivaddhanaprabha quickly made a big impression on him. "When I broke my foot I had to go down to London and we were playing against Manchester City in our first season back in the Premier League," he said. "He came to the hospital, picked me up and flew me back in his helicopter to Leicester to watch the game with him. He didn't have to do that, but he did." Schmeichel witnessed the helicopter crash, and says he still remembers every little detail from the night and immediately feared the worst. "Unfortunately, [I remember] everything. Every little detail," he said. "I had family over from Denmark and I gave them a little look around the stadium and the pitch - the helicopter was always a big attraction. "We waved him off, waved him goodbye, and we kind of just watched him go up.. I'd seen him do it hundreds of times - it was a kind of ritual thing in the end. "You could just tell something was wrong, because it doesn't normally stand still like that. And what unfolded, unfolded. "I ran straight out of the tunnel and round to that side of the stadium. People over that side of the stadium hadn't seen what had gone on. So, I came sprinting out, shouting for people to call the police, one of our security guards saw me, ran after me. "We managed to get close - our security guard got closer than I did, and he (the security guard) tried to get in and do something. "But it was very evident from the heat that there was nothing anyone would be able to do. And yeah - it was horrifying, horrible, to be that helpless." Aiyawatt 'Top' Srivaddhanaprabha, Vichai's son, has stepped up to take on his father's responsibilities, and Schmeichel has every faith he will continue the family's legacy in Leicester. "Well, I'm not one to compare people to their fathers. But from the moment I met Top, I knew he was a proper person," he said. "And I have no doubt he will do everything he can to make this club successful - for the club, for his father, for his family - it is just as much a passion for Top as it was for Khun Vichai."